There are many different types of desert recipes one can prepare, bake, or cook. Some of the most popular desert recipes include cookies. Some of the most popular cookie recipes include: Chocolate Chip, Sugar, and Oatmeal Cookies. 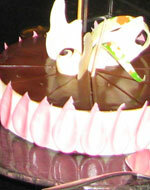 Another category of deserts include Cakes such as Red Velvet, Pound Cake, and my personal favorite Cheese Cake. Ice Cream comes in more different flavors and recipes than I can name, I love homemade Ice Cream. Pastries are just another great desert you can make. Pastries come in some many verities including Cream Puffs, Danish pastries, and Bear Claws. Any one of the most popular desert recipes has to be Pies, what’s more American than Apple pie?